Corsair’s Vegeance series is phenomenal. If this keyboard isn’t what you’re looking for, then I suggest checking out the Corsair Vengeance K90. This keyboard comes with textured keys for the W, A, S, and D keys that are commonly used with FPS (first person shooter) games. It also has the #1 – #6 keys texturized. These texture keys are optional — so you don’t have to use them if you dislike them. If you DO want to use them, then simply remove the original keys using the included tool and put in the textured versions. This is easy and fast to do. These textured keys have unique ridges on them too so that you can easily identify them with your fingers. A case is included to store the keys that you’re not using — I suggest keeping that handy. The included wrist rest is NOT full sized, which you may like or dislike. It mounts by the WASD keys so that your wrist can rest as you tap these common keys. Hybrid keys (rubber dome switches and Cherry MX Mechanical). The volume barrel roller works well. The textured keys really do help in gaming, especially during longer sessions and since there is full key matrix anti-ghosting as well as a 20 Key Rollover, you don’t have to worry about keys not being detected properly. 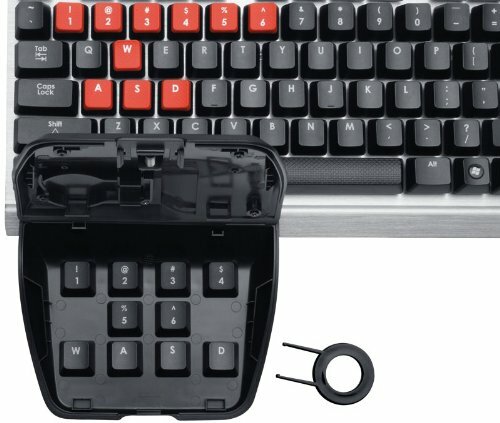 This keyboard is great for those who do a lot of FPS gaming. While it lacks all the extra hotkey, macro keys, G-Keys, etc. 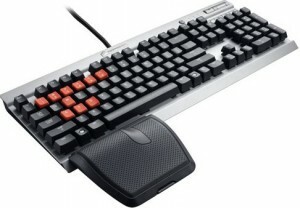 that similar gaming keyboards have, it brings texturized keys, which many keyboards do not have. This helps keep the keyboard with a smaller form factor, and since the wrist rest is not full-sized, it further ensures that’s the case. Some people may need some getting use to this keyboard since only some of the keys are textured and since the wrist rest is small, but after the initial getting-use-to stage, you’ll welcome it. Here at Geek Montage, we’ve been looking at gaming keyboards for ages. There are just so many out there that it’s hard to choose which one to buy. We recently took a look at the Logitech Gaming Keyboard G110 and were blown away. The low price range bundled with the gamer-loving features makes it a very viable option. Check out Logitech Gaming Keyboard G110 Review for more info! I went ahead and reviewed Logitech’s S520 Keyboard and Mouse Combo due to the special openbox sale going on with it today. You may view the Logitech S520 Keyboard and Mouse Review here. You may view the special Logitech S520 + Alto Dented Box Sale here. Don’t worry, Logitech gives a full warranty to its dented box items, and guarantees it to work like new. Use the code “logi_s520b_11609” to save $50. Thanks yuugotserved. In the spirit of reviews,we have reviewed the Logitech S510 Keyboard and Mouse Combo. Although it is an older set, it is still widely available and deserved some attention. You may read the Logitech S510 Keyboard and Mouse Combo Review here.